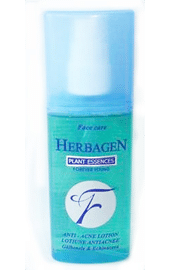 Herbagen anti acne lotion with calendula and echinacea extract is made for the care of acne complexion, very loaded with pimples, comedones and cysts. Herbagen anti acne lotion with calendula and echinacea extract – 100 ml. Meant for the care of acne complexion, very loaded with pimples, comedones and cysts. The product eliminates the cumulated impurities, it has an antiseptic, astringent, cicatrizing and degreasing action. It is recommended to use in parallel with the anti-acne cream and to apply the film mask. Does not contain dyes or fragrance. No PARABENS. Apply daily on the acne affected parts, spray on a cotton pad, avoiding the eye area. Ingredients: Aqua, Alcohol, Calendula Officinalis, Echinacea Angustholia Saloicylic Acid, PEG 1 PEG 9 Lauryl Glycol.